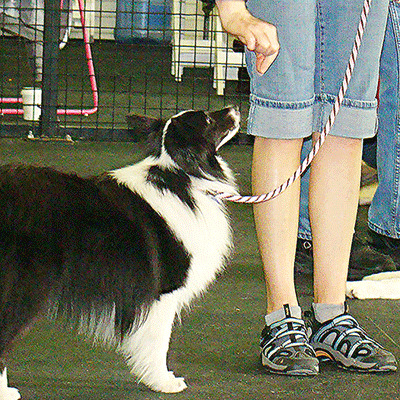 Dog training verbal commands are words we use to ask our pets to do something. They are easy to teach to your canine friend and can be useful when your hands are occupied or if your pet can't see you. Dog verbal cues can be taught to your pet as you reward a specific behavior. For example, you can say "settle" as soon as (or even before) your dog calms down; after he does it reward him with a treat. If your dog responds very well to hand signals, these can also be turned into verbal commands. Repetition is the key to help a dog understand human words. Your dog can understand both hand and verbal cues. 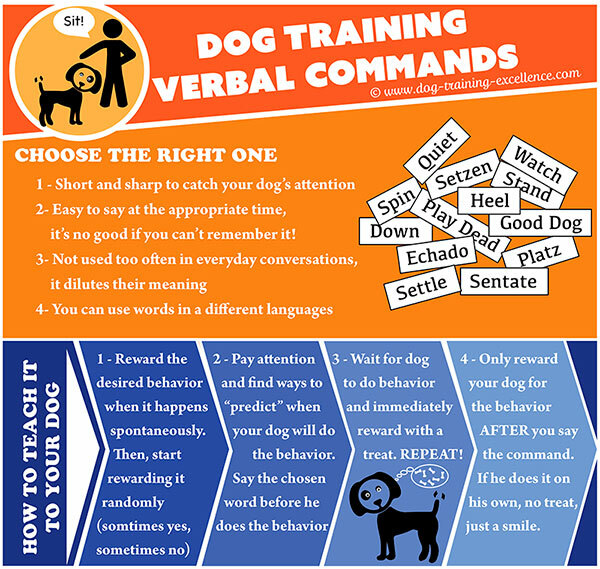 Dog training verbal commands can be in any language. Sometimes this helps dogs understand them better because they are words that happen only when we are talking to them. When you choose which word to use for an obedience command, follow these tips. Short and sharp: A hound will be more likely to understand a short and sharp verbal cue that is easily distinguishable from the rest of your flurry of word! Easy to say at the appropriate time: You could come up with crazy or fun words to use as commands, but it might take _you_ a while to be able to say them at the right time. For example: You are at the dog park and want to recall your furry friend fast because he is about to get himself into trouble. What would be easier to say "Fido Come!" or "Fido Converge!". Probably the first one, right? Use words that are not too common and often said at irrelevant times: A word that you say very often at home, when you talk on the phone or with other family members, might be a poor choice. Your pooch will hear it meaningless too often. This will make the actual command weak. For example: if you are going to use the word "OK" to release your pet from a stay position, you might be accidentally releasing him often. Or he might not pick up the word as easily because most of the time it doesn't mean anything! Find the right balance: So, should you pick the word that comes easily to you? or the word that you don't use very often (but doesn't come easily to you)?. You will have to make this decision depending on what your dog training goals are. If you want hard-core canine obedience training, then be strict with yourself and use uncommon words (read German Commands for help). If you just want a well behaved pet, use the words that come easily to you. Why? because your furry friend will not only pick up on your words but also on your body language. He will be able to figure out what you mean with practice. A behavior will happen more often if it is being rewarded. And your command should act as the "green light" for your canine friend to do the behavior and get rewarded. First clearly say the verbal cue. Immediately after do the hand signal (that your pooch already knows). Mark and reward your dogs response. Now try the verbal cue but don't do the hand signal. If he responds - Mark and reward! If he doesn't respond to your verbal command be patient and repeat steps 1-4 again until successful. Your hound must be doing the behavior for you often during a training session (this will happen if you reinforce the behavior a lot! - it's basic positive reinforcement). Your pet must be rewarded only sometimes (randomly) before you can add a command. 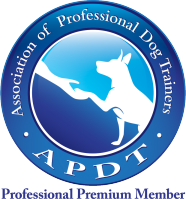 Read "How to get a reliable dog training command" for more information. Now clearly say your command. Mark and reward your canine's next response. If he does the behavior without you saying the command- Ignore it! Repeat steps 3-6 until your pet is only responding after you say the obedience command. When you start teaching your furry best friend the meaning of a word by following the above steps, DO NOT repeat the word more than once! Be patient and give him the chance to respond before you ask again. Count to 10 in your head if you have to! If you ask your pet to sit sit sit! he will only learn that sit, doesn't mean anything...but sit sit sit! means sit! Have fun teaching your pooch English words! Dog training verbal commands will improve your communication with your pet.